Many years ago, my friend, Liane brought this wonderful cheese spread to a get together. Our family loved it so much, we have served it at just about every function we’ve had ever since. It can be prepared the day before or right before you need it. This is the recipe I use for a crowd of about 20-25; for smaller gatherings, cut in half. Mix together & spread in bottom of flat bottomed bowl. Top with about 1/2 cup chunky salsa. 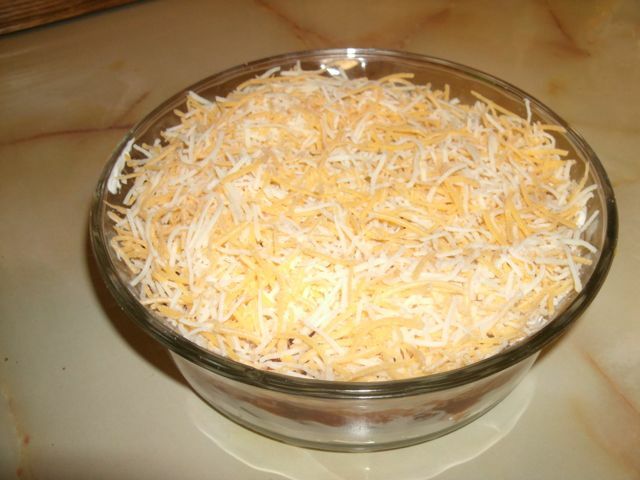 Add layer of about 3/4 cup finely shredded cheese. Use the type that is 3-4 types of cheeses blended together. Cover & chill until needed.